When Is “Fluff” Not So Fluffy? 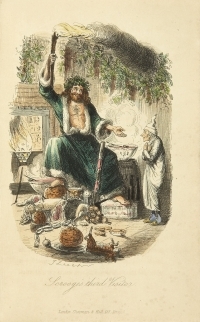 From the 1843 edition of A Christmas Carol. Holiday time in the United States means lots of things to lots of people, but for movie buffs (aka cinema aficionados, film snobs, and DVR space hogs) like me it means the return of the classic Christmas movies. And also the classic Christmas specials—the cartoons and Claymation rank right up there for me. Many people quickly dismiss these movies as—pardon the mixed metaphor—Christmas schmaltz. Overly sentimental, too much sugar, not enough substance, happy endings, memorable songs all seem to detract from these movies’ viability as “serious” works of art. And maybe they were not intended to be “serious” works of art, whatever that means. But Christmas movies, and some of the classic Christmas specials, seem to be the one “safe” opportunity each year for writers, filmmakers, and animators to explore the idea of how we create meaning in our world. The holiday season seems to give these artists permission to take willing audience members on a journey of self-reflection through the lives of the main characters. This phenomenon is not new. Some film and cultural historians (see, e.g., Turner Classic Movies’ 2011 documentary A Night at the Movies: Christmas Movies) date its beginnings with the publication of Charles Dickens’ A Christmas Carol in 1843, a story that has been filmed multiple times starting with the first silent version in 1901, and the first talking version in 1935. My preferred film interpretation stars Alastair Sim as Ebenezer Scrooge in a 1951 British production, directed by Brian Desmond Hurst. The story of A Christmas Carol has become archetypal—the miserly rich man, Scrooge is generous neither with money or kindness. He refuses a relationship with his nephew, his only living relative, wants to deny his one employee extra coal to keep the office warm, let alone time off to spend the Christmas holiday with his family, including his crippled son. But as we all know, on Christmas Eve, Scrooge’s old partner, Jacob Marley returns as a ghost to herald the arrival of three spirits—ostensibly Scrooge’s “last chance” before he suffering the same terrible fate in eternity to which the miserly Marley had also been enchained. The Ghost of Christmas Past shows how Scrooge became the man he is today—the disappointments and traumas he suffered as boy and a young man, including the emotionally unavailable father and death during childbirth of his sister, the one person he truly loved. The Ghost of Christmas Present shows him the world as it is now—how the people he know function quite well in spite of his lack of care but could clearly do much better with it, and how the woman he once loved and lost because of his desire for worldly wealth was still alive and giving to the poor and needy. He may not be poor but he now feels his need. But even after the appearance of these specters, Scrooge cries out in the 1951 version, “I’m too old and beyond hope! Go and redeem some younger, more promising creature, and leave me to keep Christmas in my own way! I am too old. I cannot change.” At which point, he runs away only to run into the Ghost of Christmas Yet to Come—the silent, shrouded ghost, who merely points and indicates. The shadow of his own death, however, and the distinct lack of mourning that accompanies it proves the ultimate teacher, for when Scrooge finally wakes in the morning—Christmas morning—alive, in his own bed, with a second chance, he jumps up to take full advantage of it, appearing almost a man deranged. And as we learn, he makes amends not only for Christmas Day but year-round for the rest of his life. Not every miserly person who watches any variation of A Christmas Carol, from the silent versions, to the Muppet version or the Mr. Magoo version or the George C. Scott version, is going to immediately identify with Scrooge and pledges to change his or her ways. But this movie opens a space for self-reflection for those who want to reflect—of course, those who don’t just watch the story unfold on its surface level. Similarly, It’s A Wonderful Life, which found its fame in its copyright expiration and thus showed up on multiple television stations year after year around Christmas time, because these stations did not have to pay to air the film. Thus, you could watch the movie simultaneously on several channels, usually hacked to bits to make room for the more lucrative commercials. Beyond its life on screen, both small and large, It’s A Wonderful Life, like A Christmas Carol, opens up space for reflection about our lives—past, present, and future. We literally see through the eyes of a guardian angel—Clarence—how George has come to reach this Christmas Day in utter despair and desperation. As we watch George knock over tables and yell at his children, can we not feel any of our own feelings of anger or despair in such similar moments. Or the remorse in the seconds that follow, as we see the reactions to our outbursts by those we love and didn’t mean to hurt. And then we get to envision the ultimate question—one I’ve used on occasion with clients—how would the world be different if we hadn’t been born? Do we ever really have a sense of how many people we touch in one lifetime? This movie brings this message home to us so clearly that our relationships to other people—our Being-in-the-World—is so intrinsic that our absence creates an entirely different world—in George Bailey’s case, one that is uglier, gaudier, and meaner. Even A Charlie Brown Christmas allows a chance to reflect on what is really important to us. Is it the commercialism of the Christmas season or is it really more about love and family and compassion and generosity and kindness? We may want to say that the argument about the holiday season as merely crass commercialism is old and hackneyed. But the sales are starting earlier and earlier each year, and now they interrupt Thanksgiving Dinner. Christmas entertainment can be just that—entertainment. But somewhere in the sentimentality lurks a little bit of room for us to look in the mirror—or the x-ray machine—and see if our own hearts have not shrunk two sizes too small. In that case, fluff is not just fluff.